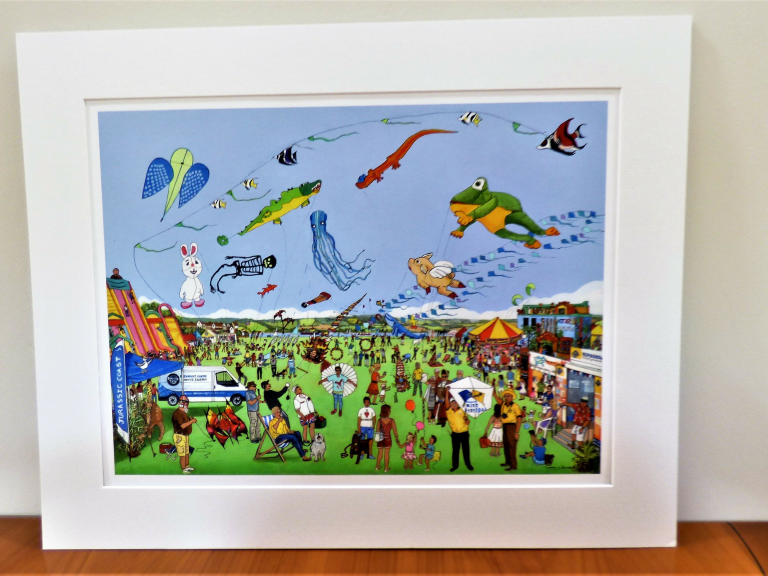 Over 10 years ago the idea of a Kite Festival in Exmouth became a reality with the enthusiasm of the local Rotary Club. Now in 2018 the event is planned to be even bigger and better than the previous nine festivals. The Rotary Club of Exmouth & District is very proud of this major Kite Festival and its success in the South West. In the nine years to date the Rotary Club has been able to support 42 local worthy cause and donations of over £83,000 have been distributed. Bring the family along and enjoy an amazing sky full of colour with kites of all shapes and sizes. We are planning some great shows for you this year from world class flyers. The arena program will feature spectacular flying displays, mass ascents of artistic kites, and breathtaking synchronized routines flown to music. jogging legs, dragons and spirit kites. 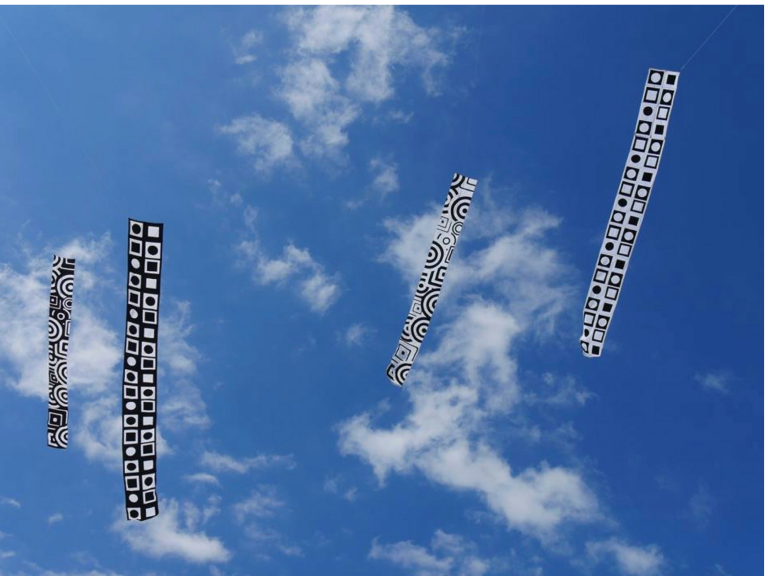 There will be fabulous artistic creations using kites as an aerial canvas. The makers intricate designs have wonderful colour, shape and flow. On both days we will be holding kite battles! Flying 6 sided Japanese Rokkaku kites the fliers willtry to topple and cut each other’s kite out of the sky until the last kite flying is crowned the winner. Let's see if the kite sponsored by Kia Marsh Exeter can emerge victorious. On Sunday the battles will be accompanied by the fantastic drummers from Taiko Journey. This will really bring some excitement to the contest. One of the UK’s premier kite festival display teams. They fly exciting choreographed kite routines set to music, often with 30 metre tails streaming from their two-line sports kites. 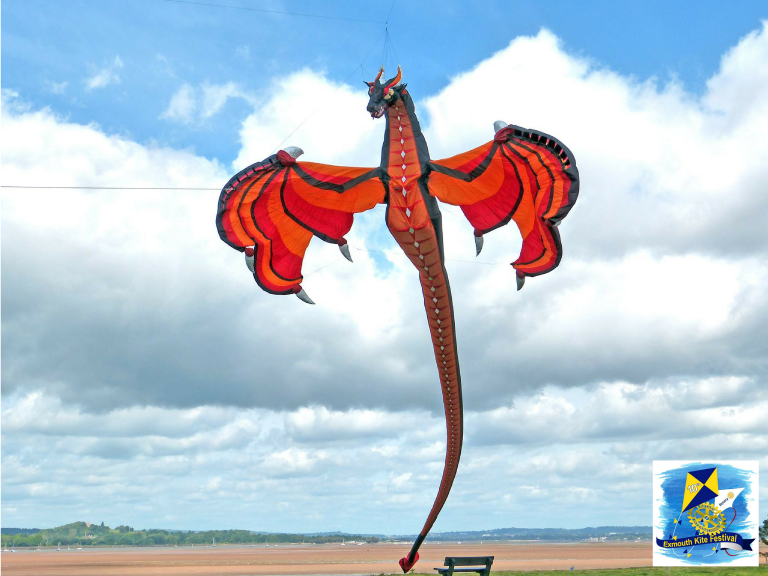 They also have one of the best collections of Chinese dragon kites in Europe ranging from 15 metres all the way up to 80 metres. Back again this year are husband and wife dual-line kite pair Flying Fish. They fly beautiful aerial ballets set to music. Let’s see if the winds are right for them to fly their Shark and Fish kites in an chase across the sky. can produce amazing control and shapes in the sky. Mike and Dave from Sussex will be brightening up the Exmouth skies with their wonderful collection of large show kites. Expect some giant animal shapes and loads of vibrant colour. Frances is an artist, photographer and filmmaker living in Northumberland. Her unique kites are made using Japanese paper, bamboo and carbon fibre. Each one is patterned using Batik which is a technique traditionally used on fabrics. Frances has modified the technique to work on paper specifically for her kites. Many of her kites are stitched together forming spaces between panels in the sky. Patterns are heavily influenced by natural forms and forces such as water. Caterina is an Italian jewellery designer and illustrator. Her unique kites feature her vibrant drawings of fairytales and imaginary worlds. We are delighted she can join us for the festival and help make it an international event. 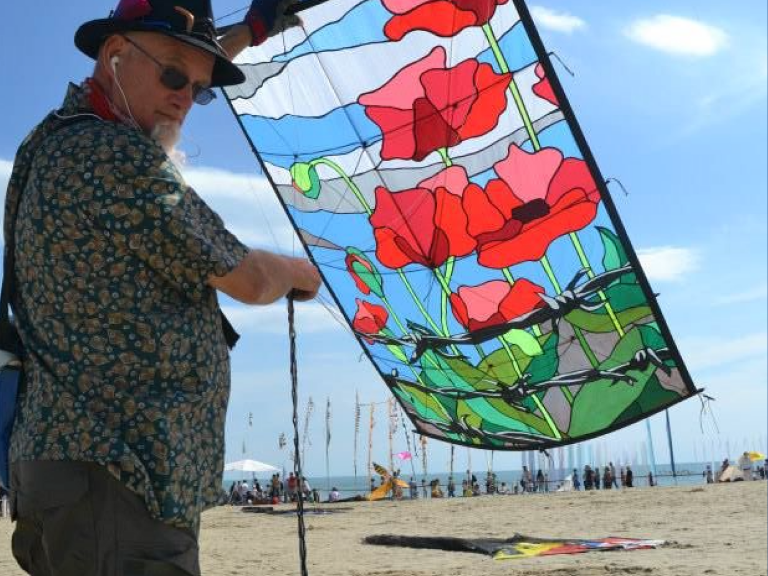 A legend of the kite world, Martin is renowned for some of the most famous and original soft kite designs. He has been invited to fly and display his kites all over the world and we are delighted he can join us for the Exmouth Kite Festival. Gill is a fantastic single line kite maker. She is recognised in the kite world as an expert in fabric dyeing and appliqué sewing techniques. Often inspired by nature Gill produces unique kites and wind banners. 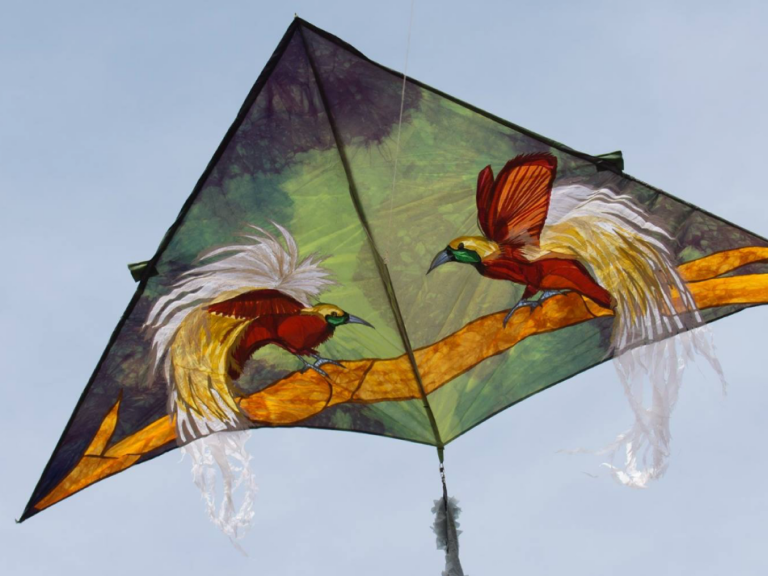 Local kite designer and maker David joins us again for the festival. He is building a reputation for striking black and white kites designs that have great presence in the sky. He will also be bringing back the bizarre concept of kite painting! Yes you can paint a picture with a flying kite. Come and find out how. maker. His Angel design kites are his trademark and an iconic kite design. Flown in groups they create a unique festival atmosphere. If the wind conditions are right we will have a mass fly of these beautiful kites. Kite dragon master Tim will be displaying his newest show kite, the wonderful purple Amarinth. Make sureyou don’t get too close – he might breathe fire! So that is what our Kite Festival is all about and as in previous years not only will the arena be full of exiting performances we will also have time for the children to join the kite flyers and bring their own creations into the arena and fly their own kite. The Children’s Marquee where all the activities start. There will be kite kits for the children to assemble, The Exmouth Art Group are once again working closely with the Rotary Club, helping to create pieces of art from waste materials. Once again we have a story teller once again that will keep the children quiet, for a short time anyway! A glitter painter and more circus skills to be learned. This 18 metre marquee has always been a popular addition to the Kite Festival and the Rotary Club would like to thank two of our local organisations that have helped with their support – The World of Country Life and Crealy Adventure Park – You might also find some friendly goats walking around the Festival with their handlers. Like most festivals there has to be other attractions for Mums and Dads as well as the children. We will have vintage cars on show, steam engines, Fairground stalls and, of course, an assortment of caters that will give you that strength make this all-day event well worth attending. To reiterate, all moneys raised will be supporting worthy causes – please come along and help those in need – At £5 per adult it has to be the best value for money for a day out in the county.